PHILADELPHIA -- Carson Wentz stood tall in a collapsing pocket and kept making plays with his arm or legs. Philadelphia Eagles left tackle Jason Peters and linebacker Jordan Hicks are out for the season after suffering injuries during Monday night's game against the Washington Redskins. 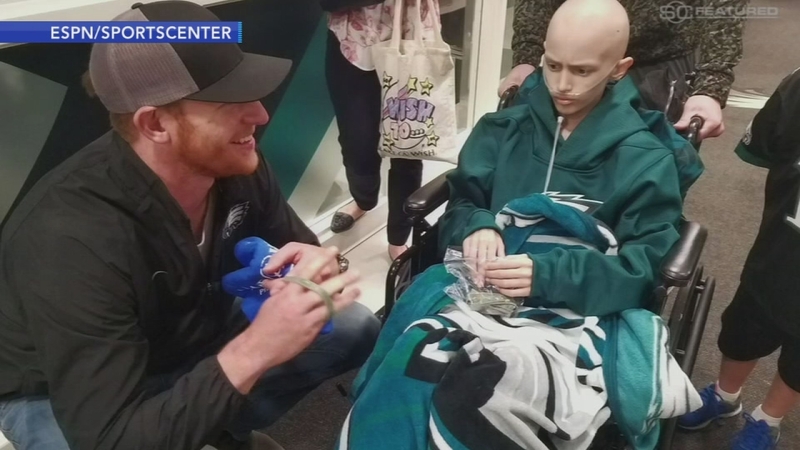 "You step up and go into make-a-play mode," Wentz said after making one highlight play after another in front of a national audience while cementing his status as a first-half MVP candidate. The second-year quarterback threw for 268 yards and ran for a career-best 63 after a shaky start to lead the NFL-best Eagles (6-1) to their fifth straight win. But the victory was costly because Peters was carted off the field with a knee injury in the third quarter. Kirk Cousins threw for 303 and three TDs for the Redskins (3-3). "Carson made some unbelievable plays there in crunch-time situations," Redskins coach Jay Gruden said. "We lost and it wasn't good enough by anybody, offensively. But Kirk competed and made some great throws, some great plays." When you watch the Eagles play this season, look to the wrist of Carson Wentz. 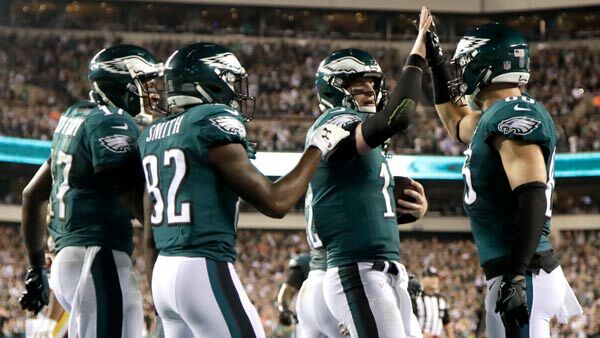 The Eagles went three-and-out three times in their first four drives and had only 57 total yards before Wentz hit Mack Hollins in stride with a perfect 64-yard TD pass to tie it at 10. That got the offense rolling. Wentz connected with Zach Ertz for 46 yards on the next series and found him again for a 4-yard TD pass to make it 17-10. After getting the second-half kickoff, the Eagles drove 86 yards for another touchdown. Peters was injured during the series, and fans chanted his name while teammates surrounded the cart. Wentz finished the drive off with a play that Peters would appreciate. While being hit by two defenders and falling forward, Wentz lofted a 9-yard TD pass to Corey Clement. "One of the best plays I've seen in a long time and by two young guys," Eagles coach Doug Pederson said. "To hang in there and take shot after shot, it's amazing to me." Wentz fired a 10-yard TD pass to Nelson Agholor to expand the lead to 31-17. Wentz kept that drive alive by escaping a sack and running 17 yards on third-and-8. "That's what makes him so special," right tackle Lane Johnson said. "He has great field vision, and he's got something a lot of guys don't have." Cousins tossed a 7-yard touchdown to Chris Thompson to give the Redskins a 10-3 lead. He connected with Jordan Reed on a 5-yard TD to cut the deficit to 24-17 and threw a 12-yard pass to Reed to cap the scoring. The Eagles were penalized on four straight plays to start their first possession before Wentz was intercepted by Quinton Dunbar on a deep pass to Torrey Smith on second-and-31. Philadelphia swept Washington for the first time since 2013 and has a commanding lead in the NFC East. The Cowboys and Redskins are tied for second place. Redskins: LT Trent Williams (knee), CB Fabian Moreau (hamstring), RG Brandon Scherff (knee) and LB Preston Smith (groin) were hurt. Eagles: LB Jordan Hicks (ankle) got hurt on the first series. Peters was replaced by Halapoulivaati Vaitai. Pederson didn't have an update after the game. Redskins WR Terrelle Pryor had two catches for 14 yards and didn't start. Eagles first-round pick Derek Barnett had his first two-sack game. Eagles kicker Jake Elliott connected from 50 and 42 yards before he missed from 45 yards, ending his streak at 12 straight field goals. Four of those were from beyond 50 yards, including a 61-yarder. Six-time Pro Bowl kicker David Akers was inducted into the Eagles' Hall of Fame at halftime. Akers is the team's all-time leader in regular-season points (1,323) and games (188) and postseason points (134) and games (19). Redskins: Host the Dallas Cowboys (3-3). Eagles: Host the San Francisco 49ers (0-7).